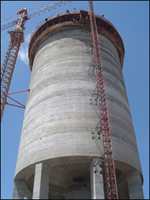 Claudius Peters Brasil has recently been awarded a multi-million euro contract to supply four complete mixing chamber silo systems to Votorantim Cimentos (VC), one of the largest cement producers in the world. This order follows on from previous MC silos supplied to VC in the last four years. The new silos which will handle raw meal are capable of storing, mixing and dosing a total of almost 40,000 tonnes of raw material. *Votorantim Cimentos is one of the world’s top ten cement companies. Votorantim Cimentos is investing more than R$ 2 billion throughout Brasil to increase production capacity by 30% by 2011. New factories are being built, and existing units are being reactivated, expanded and upgraded with many of these operations already up and running. Their goal is to move closer to the final consumer in step with a tendency to regionalize and decentralize consumption of cement in Brazil.